Nicknamed "Sassy," Sarah Vaughan was one of the top female jazz singers of all time. Her wide, perfectly controlled range often ranked her with Ella Fitzgerald and Billie Holiday. Vaughan was an NEA Jazz Master, and this program is supported by the NEA. 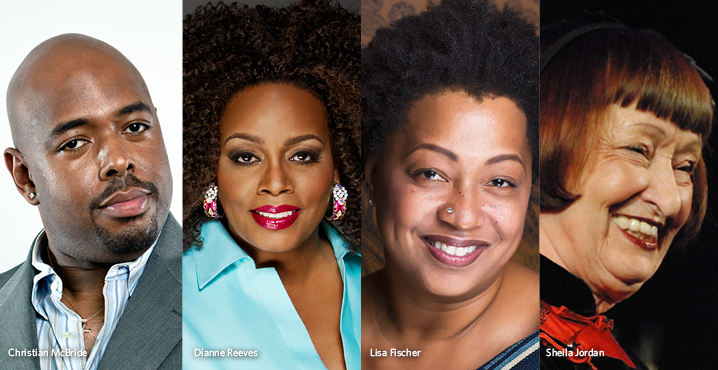 Four-time Grammy winner Dianne Reeves has recorded and performed extensively with the Lincoln Center Jazz Orchestra and Wynton Marsalis, who said of the singer, "She has one of the most powerful, purposeful and accurate voices of this or any time." She was the first Creative Chair for Jazz for the Los Angeles Philharmonic and the first singer to perform at the famed Walt Disney Concert Hall. Reeves appeared throughout George Clooney's Good Night and Good Luck and performed every song on the Grammy-winning soundtrack. After four decades of singing background for icons like the Rolling Stones and Tina Turner, Grammy winner Lisa Fischer embarked on a new musical journey with the success of the Oscar-winning documentary Twenty Feet from Stardom. The film told her story, complete with clips of her 1991 R&B hit "How Can I Ease the Pain," live footage of her legendary duets with Mick Jagger on "Gimme Shelter," and glowing testimonials from famous colleagues like Sting, Patti Austin and Chris Botti. Raised in poverty in Pennsylvania's coal-mining country, Sheila Jordan began singing as a child and was working in Detroit clubs by her early teens. Her uncompromising style and unique musical trademarks include frequent and unexpected sweeping changes of pitch. She is recognized for her collaborations with bassist Cameron Brown in performance and the recording studio. NJPAC Jazz Advisor Christian McBride, the recently named Artistic Director of the Newport Jazz Festival, is a five-time Grammy Award-winning bassist-composer who, since the early '90s, has recorded over 300 dates as a sideman and released albums as a leader since '95. Aside from various stints with Sting, Chick Corea, Pat Metheny, Roy Haynes, John McLaughlin and George Duke, among others, McBride tours consistently with his trio and his quintet, Inside Straight. He also fronts the Christian McBride Big Band, whose album The Good Feeling won a 2012 Grammy for Best Large Jazz Ensemble Album. Ticket holders are invited to arrive at 6pm for The Divine One, a free film and discussion about Vaughan's life and performance career, hosted by Todd Barkan in the Victoria Theater. For more than 40 years, Barkan has distinguished himself as a world-renowned jazz concert and record producer. For performance details, click here.